On 17 August, the inaugural Australian Education Awards were held at Dockside Sydney, bringing together nearly 500 principals, department heads and teachers under the one roof. 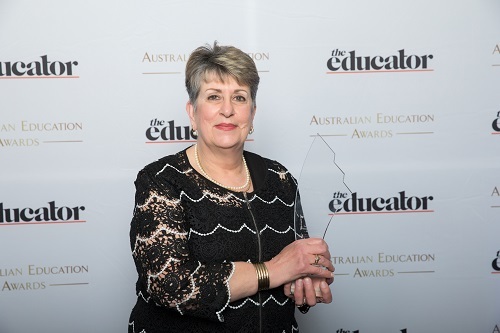 While it was a night to remember for those who attended, it was particularly special for Meadowglen Primary School principal, Loretta Piazza, who was surprised to be called up to the podium as Primary School Principal of the Year – Government. “As principals, we go to school every day, we give our very best to our kids, parents and communities,” Piazza told The Educator. Piazza began her teaching career in the late 1970s, when she was a teacher at Ruthven Primary School, in Melbourne’s northern suburbs, along with eight graduates from Coburg Teachers College. “I’m not sure how effective I was as a teacher, but I loved turning up every day and having fun with the kids,” Piazza recalled. In 1988, Piazza was promoted to a ‘Band 2’ position at Thomastown Meadows. “This was the turning point in my career; my principal, Charlie O’Connor, encouraged me to aim for the principalship,” Piazza said. And aim for the principalship she did. Between 1990 and 1999, Piazza completed her Graduate Diploma and Master of Educational Administration at the University of Melbourne. “I chose to study ‘Women in Leadership’ because at that time only 30% of principals were female,” she said. As part of her research, Piazza met and interviewed a number of strong and influential women, the most notable being Victorian Premier, Joan Kirner. “In the year 2000, I had my first principal appointment at Pascoe Vale North Primary School. As the only female principal in the Coburg-Pascoe network, I felt under pressure to prove myself,” Piazza said. However, it wasn’t until four years later that Piazza “morphed” into the leader she considers herself today. Piazza says heading up Meadowglen Primary School, along with its 750 students and tough clientele, posed “enormous challenges”. “Fourteen years later, thanks to a strong leadership team and dedicated staff, we have a school culture that is underpinned by order and high expectations,” she said. In 2013, Piazza and her friend and principal colleague, Mark Thompson, completed a Doctor of Education degree at the University of Melbourne. Piazza says it was this “unique friendship” that enabled them to survive the “long and arduous eight year journey”. But just one year later, tragedy struck when Thompson took his own life due to work-related issues in December 2014 – a turn of events that Piazza said “rocked the whole education community”. In the lead-up to Thompson’s death, he and Piazza had been researching the career aspirations of assistant principals. When our paper was published after his death, it gained national media attention. “We had found that assistant principals were not applying for principal jobs due to the lack of support from the Education Department and high levels of stress associated with the job,” Piazza said. These days, Piazza has become a strong voice and advocate for principal health and wellbeing. “I maintain my links with the numerous University of Melbourne experts who have helped shape my research acumen,” Piazza said.